<br>Dive into the storybook world of Medieval Games! Battle dragons, storm the castle, or joust with up to three of your friends in a quest to become the tournament champion. Choose from eight iconic characters such as the Knight,Princess, or Wizard as you experience Free Play, Tournament, and Board Game modes. 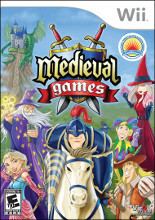 Good olde light hearted humor, easy pick up and play action, and addictive gameplay make Medieval Games a favorite for all families!